Whatever happened to … Wasatch Springs Plunge? Leah Hogsten | The Salt Lake Tribune Wasatch Springs Plunge building, November 14, 2014. Utah Historic Site marker reads: Wasat Leah Hogsten | The Salt Lake Tribune Warm Springs Park, November 14, 2014. Leah Hogsten | The Salt Lake Tribune Warm Springs Park, November 14, 2014. Leah Hogsten | The Salt Lake Tribune Wasatch Springs Plunge building, November 14, 2014. 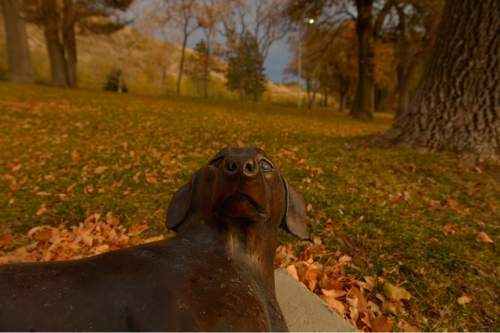 Utah Historic Site marker reads: Wasat Leah Hogsten | The Salt Lake Tribune Warm Springs Park, November 14, 2014. Leah Hogsten | The Salt Lake Tribune Wasatch Springs Plunge building, November 14, 2014. Utah Historic Site marker reads: Wasat Leah Hogsten | The Salt Lake Tribune Warm Springs Park, November 14, 2014. Leah Hogsten | The Salt Lake Tribune Wasatch Springs Plunge building, November 14, 2014. Utah Historic Site marker reads: Wasat Leah Hogsten | The Salt Lake Tribune Wasatch Springs Plunge building, November 14, 2014. Utah Historic Site marker reads: Wasat Children's Museum of Utah on Beck St. in SLC. Hartmann/photo 8/8/06 Leah Hogsten | The Salt Lake Tribune Wasatch Springs Plunge building, November 14, 2014. Utah Historic Site marker reads: Wasat Courtesy | Utah State Historical Society Warm Springs Bath House 1868. Courtesy | Utah State Historical Society Image shows the remains of a July 1922 fire at the Warm Springs Resort, north of Salt Lak Courtesy | Utah State Historical Society Wasatch Warm Springs Plunge, now the Children's Museum, Oct. 12, 1939. 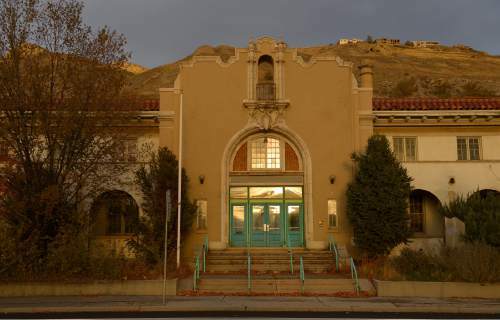 Courtesy | Utah State Historical Society Warm Springs Bath House, now the Children's Museum. Preservation. Leah Hogsten | The Salt Lake Tribune Wasatch Springs Plunge building, November 14, 2014. Utah Historic Site marker reads: Wasatch Springs Plunge. Built near several warm springs, the Wasatch Springs Plunge is significant for its Mission style architecture and as an early municipal recreational facility. The warm springs along this portion of the Wasatch Fault were used by Native Americans even before the arrival of the Mormon pioneers who quickly developed the springs and constructed numbers bathing facilities, praising the warm sulfurous water for its curative and rejuvenating qualities. This substantial masonry building was built by Salt Lake City in 1921 and replaced earlier frame buildings. Due to problems with the water, deterioration of the structure, construction of newer pools and changes in demographics, the facility fell into disuse in the 1970s and was closed. It was later rehabilitated and reopened in 1983 as The Children's Museum of Utah. Leah Hogsten | The Salt Lake Tribune Warm Springs Park, November 14, 2014. Leah Hogsten | The Salt Lake Tribune Warm Springs Park, November 14, 2014. Leah Hogsten | The Salt Lake Tribune Wasatch Springs Plunge building, November 14, 2014. Utah Historic Site marker reads: Wasatch Springs Plunge. Built near several warm springs, the Wasatch Springs Plunge is significant for its Mission style architecture and as an early municipal recreational facility. The warm springs along this portion of the Wasatch Fault were used by Native Americans even before the arrival of the Mormon pioneers who quickly developed the springs and constructed numbers bathing facilities, praising the warm sulfurous water for its curative and rejuvenating qualities. This substantial masonry building was built by Salt Lake City in 1921 and replaced earlier frame buildings. Due to problems with the water, deterioration of the structure, construction of newer pools and changes in demographics, the facility fell into disuse in the 1970s and was closed. It was later rehabilitated and reopened in 1983 as The Children's Museum of Utah. Leah Hogsten | The Salt Lake Tribune Warm Springs Park, November 14, 2014. Leah Hogsten | The Salt Lake Tribune Wasatch Springs Plunge building, November 14, 2014. Utah Historic Site marker reads: Wasatch Springs Plunge. Built near several warm springs, the Wasatch Springs Plunge is significant for its Mission style architecture and as an early municipal recreational facility. The warm springs along this portion of the Wasatch Fault were used by Native Americans even before the arrival of the Mormon pioneers who quickly developed the springs and constructed numbers bathing facilities, praising the warm sulfurous water for its curative and rejuvenating qualities. This substantial masonry building was built by Salt Lake City in 1921 and replaced earlier frame buildings. 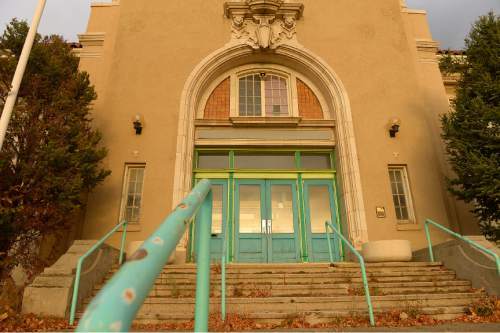 Due to problems with the water, deterioration of the structure, construction of newer pools and changes in demographics, the facility fell into disuse in the 1970s and was closed. 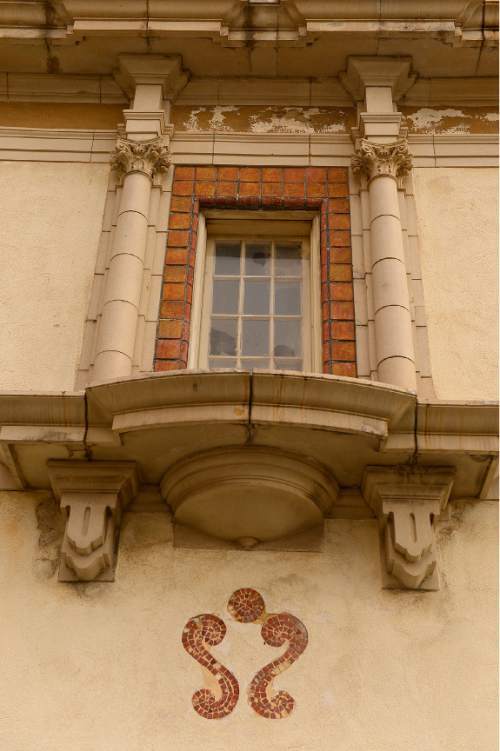 It was later rehabilitated and reopened in 1983 as The Children's Museum of Utah. Leah Hogsten | The Salt Lake Tribune Warm Springs Park, November 14, 2014. Leah Hogsten | The Salt Lake Tribune Wasatch Springs Plunge building, November 14, 2014. 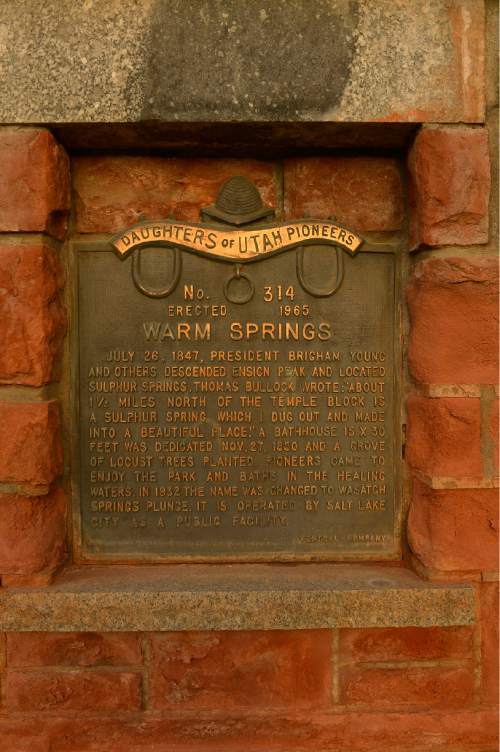 Utah Historic Site marker reads: Wasatch Springs Plunge. Built near several warm springs, the Wasatch Springs Plunge is significant for its Mission style architecture and as an early municipal recreational facility. The warm springs along this portion of the Wasatch Fault were used by Native Americans even before the arrival of the Mormon pioneers who quickly developed the springs and constructed numbers bathing facilities, praising the warm sulfurous water for its curative and rejuvenating qualities. This substantial masonry building was built by Salt Lake City in 1921 and replaced earlier frame buildings. Due to problems with the water, deterioration of the structure, construction of newer pools and changes in demographics, the facility fell into disuse in the 1970s and was closed. It was later rehabilitated and reopened in 1983 as The Children's Museum of Utah. Leah Hogsten | The Salt Lake Tribune Wasatch Springs Plunge building, November 14, 2014. Utah Historic Site marker reads: Wasatch Springs Plunge. Built near several warm springs, the Wasatch Springs Plunge is significant for its Mission style architecture and as an early municipal recreational facility. The warm springs along this portion of the Wasatch Fault were used by Native Americans even before the arrival of the Mormon pioneers who quickly developed the springs and constructed numbers bathing facilities, praising the warm sulfurous water for its curative and rejuvenating qualities. This substantial masonry building was built by Salt Lake City in 1921 and replaced earlier frame buildings. Due to problems with the water, deterioration of the structure, construction of newer pools and changes in demographics, the facility fell into disuse in the 1970s and was closed. It was later rehabilitated and reopened in 1983 as The Children's Museum of Utah. Children's Museum of Utah on Beck St. in SLC. Hartmann/photo 8/8/06 Leah Hogsten | The Salt Lake Tribune Wasatch Springs Plunge building, November 14, 2014. Utah Historic Site marker reads: Wasatch Springs Plunge. Built near several warm springs, the Wasatch Springs Plunge is significant for its Mission style architecture and as an early municipal recreational facility. The warm springs along this portion of the Wasatch Fault were used by Native Americans even before the arrival of the Mormon pioneers who quickly developed the springs and constructed numbers bathing facilities, praising the warm sulfurous water for its curative and rejuvenating qualities. This substantial masonry building was built by Salt Lake City in 1921 and replaced earlier frame buildings. Due to problems with the water, deterioration of the structure, construction of newer pools and changes in demographics, the facility fell into disuse in the 1970s and was closed. 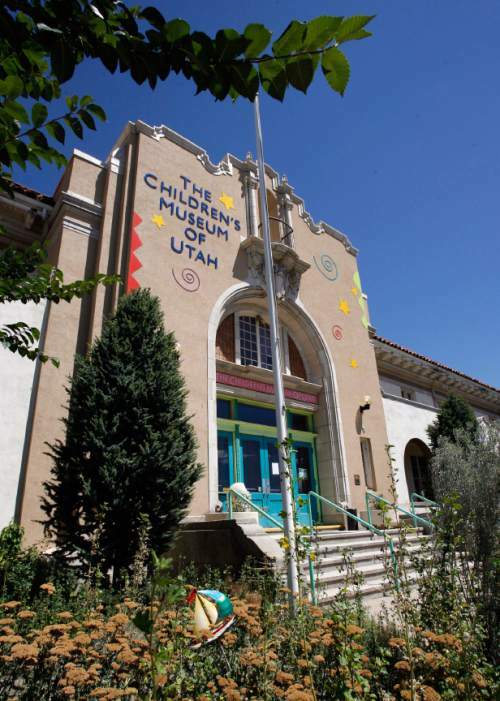 It was later rehabilitated and reopened in 1983 as The Children's Museum of Utah. 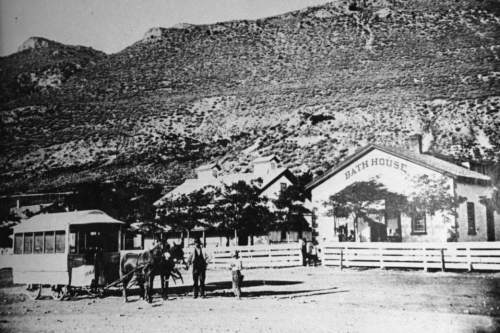 Courtesy | Utah State Historical Society Warm Springs Bath House 1868. 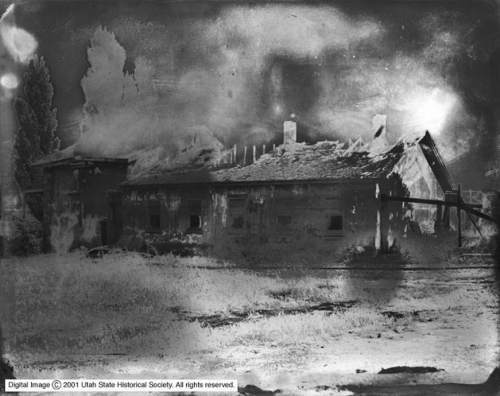 Courtesy | Utah State Historical Society Image shows the remains of a July 1922 fire at the Warm Springs Resort, north of Salt Lake City. Courtesy | Utah State Historical Society Wasatch Warm Springs Plunge, now the Children's Museum, Oct. 12, 1939. 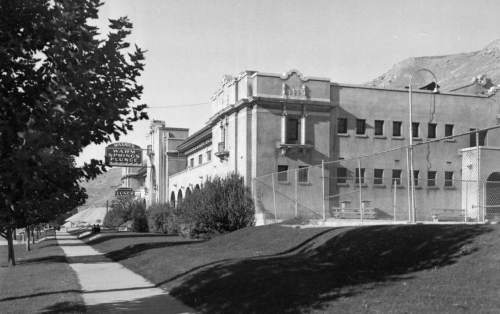 Courtesy | Utah State Historical Society Warm Springs Bath House, now the Children's Museum. Preservation. 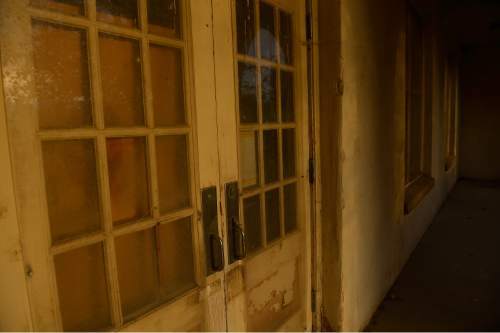 The abandoned building on the outskirts of Salt Lake City once was a gathering place centered around the water that "healed" Mormon pioneers but led to the deaths of hundreds of Indians. For generations, children splashed in its enormous pools, which were later drained and used to store filing cabinets for a museum. 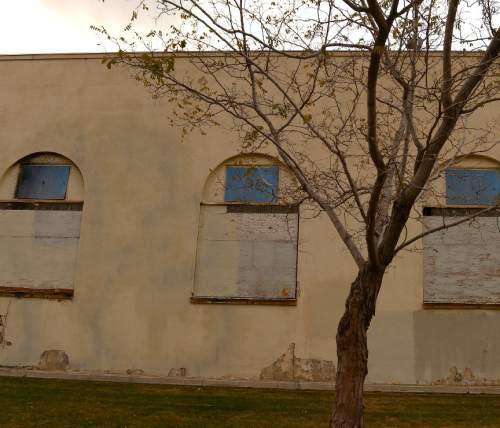 Now, its red roof tiles and Spanish facade are crumbling, and Salt Lake City has no clear plan for what to do with this iconic site. Whatever happened to Wasatch Springs Plunge? 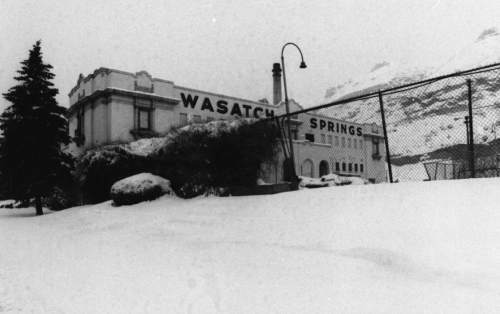 Nearly anyone who was in Salt Lake City through the 1970s likely stepped through the doors of Wasatch Springs Plunge, 840 N. Beck Street (300 West), and into the naturally warm waters that were piped into its pools from the surrounding hot springs. The two pools  one 50 feet by 120 feet and the other 25 feet by 50 feet  often were stocked with swimmers of all ages. Some dove off the boards, others played or worked out on the tricky bars, while still others lounged in the sun near the outdoor pool. But hanging out in the sulfurous waters started well before it was marketed to families living along the Wasatch Front. Shoshones, Utes and Paiutes used the springs during hunting expeditions. Tragically, when they bathed after Mormon pioneers started using the waters in the 1840s, many American Indians caught measles and died. 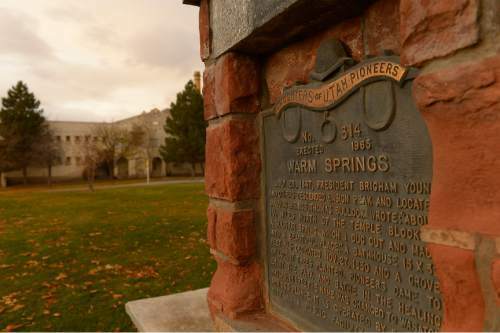 Mormon pioneers, however, touted the springs as having healing properties. Thomas Bullock helped dig out the first pool, and he wrote, "These springs, like the pool of Siloam, heal all who bathe, no matter what their complaints … Oh what a blessing for the rheumatic; cramps, sprains, bruises, itch, every skin disease, and almost every complaint will here be healed." By the summer of 1850, a building was constructed over the springs to create an indoor pool for women with an outdoor swimming hole for men. The adobe structure was a social hall, which was dedicated by Mormon leader Brigham Young and served as the first public place for dances in Salt Lake City. 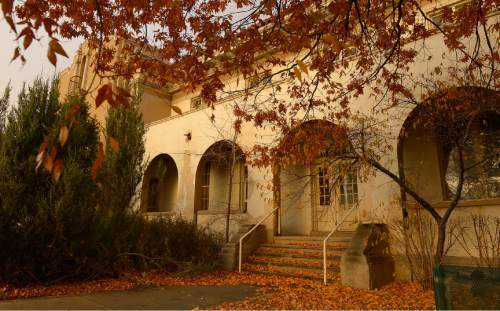 The city took over management in 1921 and called it the Warm Springs Municipal Bath. The city changed the name in 1932 to Warm Springs Plunge to draw more of a summer crowd, wrote Kathryn MacKay, a historian at the University of Utah&apos;s American West Center, in a nomination for the National Register of Historic Places. The building earned that status in May 1980. Concerns about the cleanliness of the water arose over time, including a study by the U. that found copious amounts of bacteria in the water. As baby boomers became older, they began going to places such as movie theaters instead of hot springs. Essentially, the Plunge closed in 1976 because it couldn&apos;t draw a big enough crowd to cover its expenses, according to a report on the building by MJSA Architecture and Interior Design. It was used as a storage facility after it closed. But in 1983, it opened as the Children&apos;s Museum of Utah, again creating memories for kids and their parents  from the shopping center filled with plastic food to the flight cockpit. Museum staffers would descend into the drained pools to search through filing cabinets stored there. The museum director&apos;s office also featured a shower, a relic of times past. The museum closed in 2003 or 2004, according to Art Raymond, spokesman for Salt Lake City, and moved to The Gateway mall in 2006. The building has not had a new tenant since then. Raymond said the city still is working on a long-range plan for the site, and several possible tenants have considered renting or buying the property. However, the aged building presents several challenges: it needs a new roof and new plumbing, electrical, heating and air conditioning systems. "It&apos;s a sizable financial investment for any potential tenant or new owner, but we are continuing to work on what a future use might look like," Raymond said. Some still take advantage of the warm waters nearby. At Warm Springs Park, soap wrappers usually dot the ground and passersby may catch a glimpse of homeless folks taking an illegal dip. Did you once dine regularly at a favorite restaurant, hang out at the coolest corner joint or buy a special item at a store that no longer exists? Curious what happened to it? 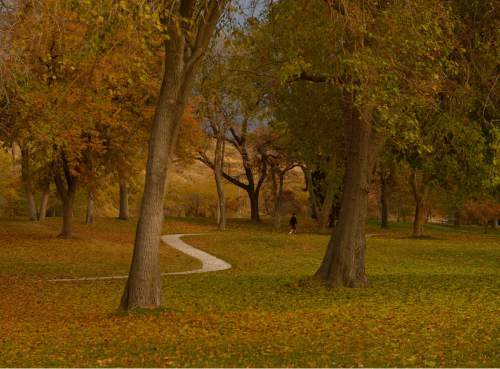 Share your once-favorite spots with The Tribune via email at whateverhappenedto@sltrib.com, and we&apos;ll see if we can figure out their fate and share it with our readers.